Is a dollhouse on your list this year? 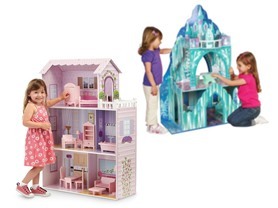 Head over and check out these Teamson Fancy Mansion Wooden Dollhouse w/Furniture -OR- Ice Mansion Wooden Dollhouse w/Furniture $69.99 - $79.99! -The hand carved three-dimensional furniture includes pieces for the kitchen, living room, bedroom and bathroom.